I love Christmas time! I’m so excited, but it means I’m in Chicago. Not like I could be flying because bad weather has been keeping me down. I realize I NEED to go up soon because I’m getting nervous about haven’t flown in awhile. I’ll fix that in January. Santa Files A Flight Plan I enjoy this because you can kind of hear the responses and I believe he’s actually on the phone trying to do it. At least the person seems to be playing along. I really enjoy these since I’ve been stealing Jake’s Jeppesen plates and studying them. 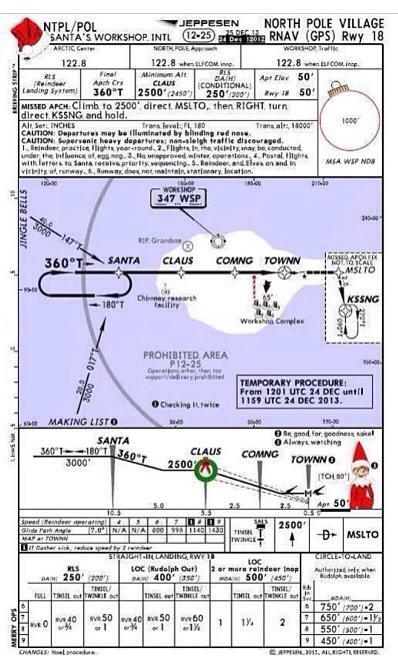 Santa’s Checkride I posted this on my Facebook page, but if you didn’t see it, it’s funny…and sad. So many more pictures and videos, but those are definitely my tops. I hope everyone has a great holidays with friends and families. I hope there is a TON more to report in the New Year. We’ll see, I’m remaining optimistic as always. 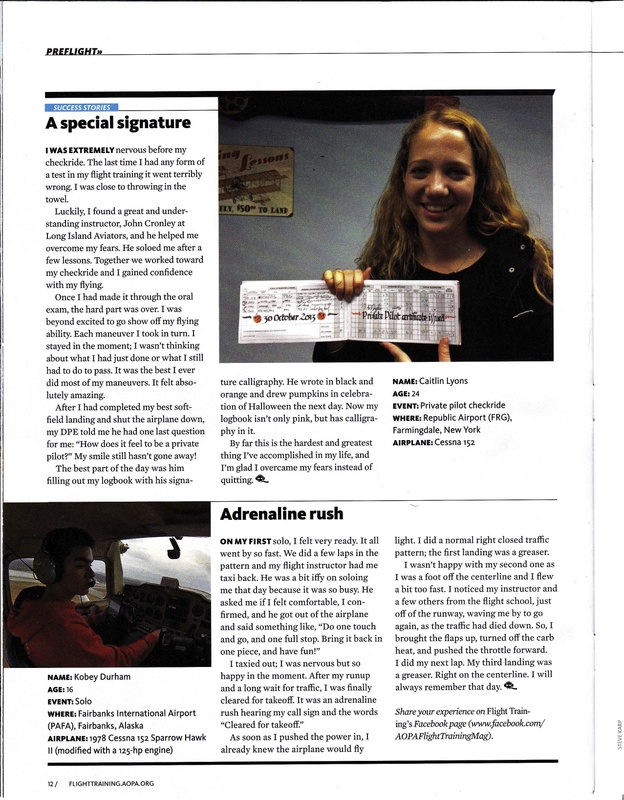 After I got my PPL, I ended up sharing it and my awesome logbook calligraphy on AOPA Flight Training Magazine’s Facebook page. They in turn shared it with their followers and it got over 600 likes. Because of that someone from the magazine contacted me and said because it was popular they wanted to feature the picture in the Success Story section! I’m was excited I got to write a little bit to go along with the picture. I wasn’t even sure where to start, since you know I have written so much about my training and all. But I wrote a little bit about my struggle at first and just a bit about my check ride. Still can’t believe some of my writing is in print for AOPA! I’d love to make that happen more, but baby steps. It’s been a month since I’ve flown. That’s sad. 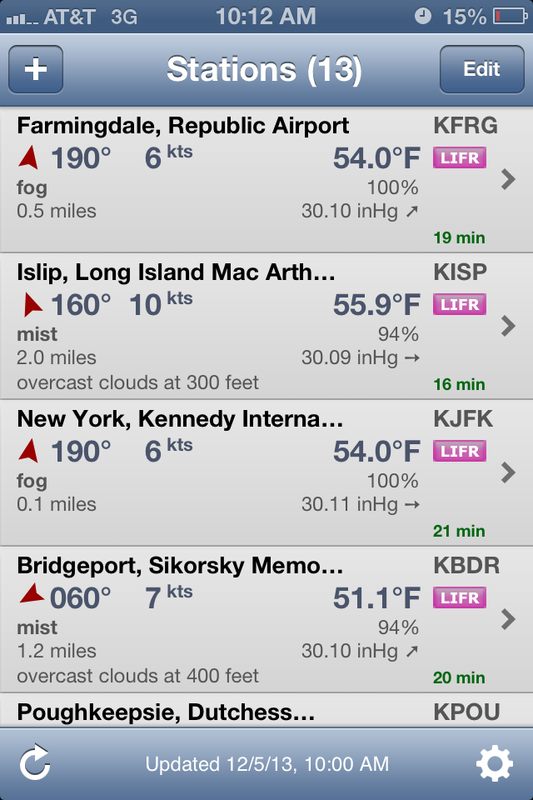 I was going to go with a friend on a cross country to Sky Acres today, but here’s what came up on AeroWeather, the JFK METAR was worst: 051610Z 19007KT 1/16SM R04R/1800V2600FT FG OVC002 12/11 A3008 RMK AO2 SFC VIS 1/2. Ouch. So definitely no flying today. 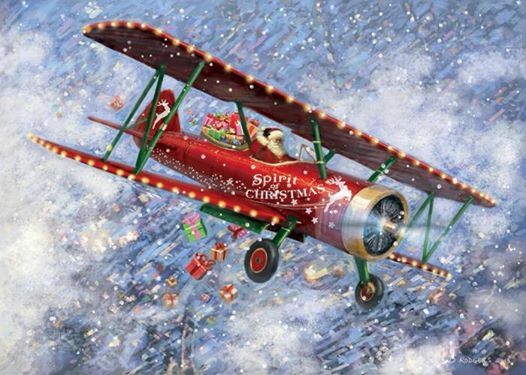 Jake had to fly – well, wait to fly – in that weather. I could luckily cancel my flight unlike him. Otherwise in life, there are some things I constantly need to remind myself about, specifically that life is a marathon. I’m a very impatient person and sometimes I just want everything to happen in a snap, but that’s now how life works. I’ve been working very hard lately on planning at least the first part of my 2014. I don’t have much left to do to finish out 2013, so why not plan? But then I figured out I have A LOT to do next year, or that I want to do. As some of you can guess from previous posts, or not, I’ve been having a sort of “quarter life crisis” lately, knowing I want to change my career, but uncertain of where to go with my life. Well, it came to a climax on Thanksgiving. I used my best resource of Jake and we spent a bit talking about what career would be best. While I brought up flying, he pointed out that I’d be in the same position I’d be now if I was just a CFI. No real idea what I’d be making month to month, probably no healthcare, and living a pretty stressful life. We talked a lot on Thanksgiving – pausing to have dinner with his family – and becoming an airline dispatcher sounds like the best option. Well, try for that and if ATC starts hiring or a ramp controller a few years down the line for real good money. I actually only really knew what dispatchers do because of other blogs, but I hear from Jake on occasion about dispatch. For those that don’t know, they are the people who actually plan the flights and do all the performance calculations. I liked the cross country planning phase of my training, while this will be ten times more intense, I think I’d like it. Dispatchers also need to be licensed by the FAA and require at least 200 hours of instruction. So I have to go back to school. I’ve already narrowed my schools down to three different ones, two do distance learning plus a residency period and the other one is in NYC for six weeks, so still working on deciding what will be best for me and look good on job applications. I ‘ve already ordered some books that came today. 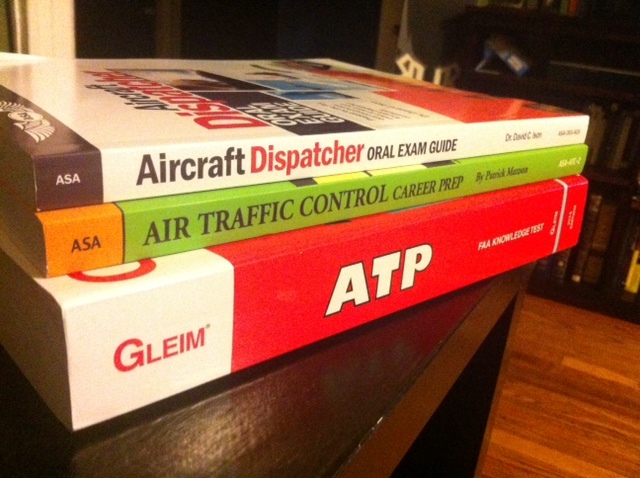 A book to learn more about ATC and prep if the test ever opens up, and then a dispatcher book, the ATP test prep book is because the dispatcher written is very similar to the ATP test and it has a section for dispatchers in it too. Look at the size of that book! Lots of knowledge to cram into my brain. So that’s going to take up a lot of my new year, while I still have commitment to another job that is for two months and I’ll be working about ten hours, seven days a week. That makes it I can’t go into school until at least the end of March. Next exciting thing is I’m helping Girls With Wings try to enter the Air Race Classic with a team of past scholarship winners. I’m helping head up this project so have a feeling I’ll be quite busy with this – you know, in addition to work, studying, etc. It’s still in the development stage and we’re putting concrete things together. I can’t wait until it “officially” begins! Here’s the thing that comes along with that, one of the race pilots needs to have an instrument rating or 500 hours, let’s face it, instrument rating is more plausible. I feel I might be in the best position to get it, but am feeling a bit stressed about it. I want to do it, but obviously money and time will be an issue. Time because of that job for two months. Money because I’m going back to school for a new career, while that isn’t a significant investment it’s still a few thousand dollars for schooling. I’ve been lucky enough to make it this far in life without debt, maybe I should keep it that way. I’ll just let ideas stew in my mind and assume at some point there’ll be a light or spark or something! Those are the things I’ll be working on to start the new year. There are other plans swimming in my head, but I think I need to learn to not overload myself at first! I already decided I’ll hold off and plan an event for Women of Aviation Week another year, which was something I really wanted to do but with my work schedule I don’t think it’ll work this year. Again, the whole life is a marathon thing. I have another flight planned for this month, we’ll see if the weather cooperates!